Compact wheel loaders are making waves here in North America. 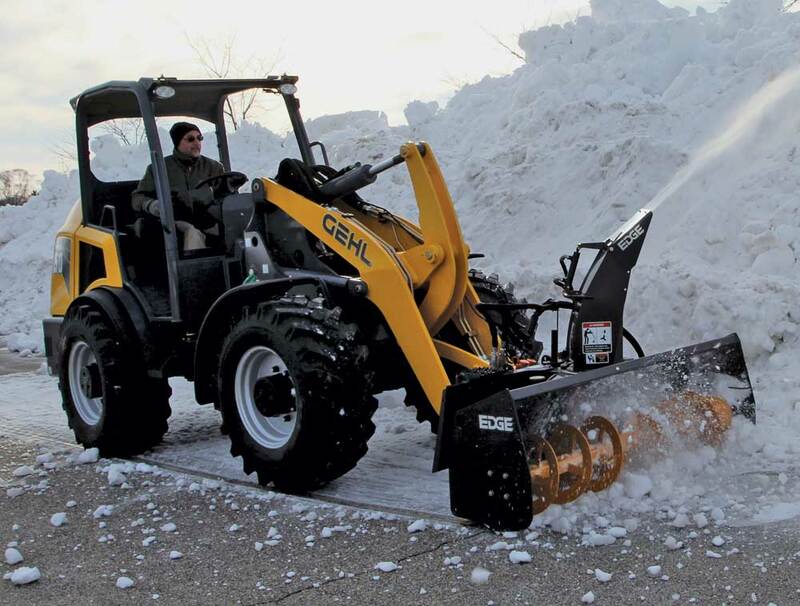 Thanks to their size, comfort, maneuverability and safety, these machines are not only perfect for the jobsite but in snow removal applications too. So just because the weather takes a turn, it doesn’t mean your operations have to stop. 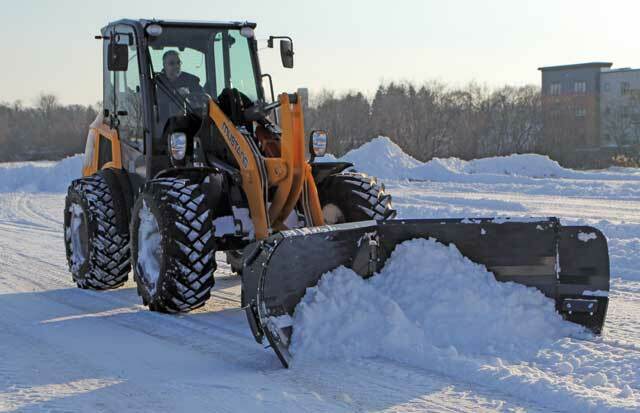 Although a compact wheel loader is a prime candidate for snow removal, you probably shouldn’t just roll it into the cold and expect it to perform to its potential. It takes a little prep and the right attachment to get the machine ready for winter work. Protecting the machine from the elements is always a good idea. Since the compact wheel loader — and its metal components — will be exposed to salt on the road, it’s important to wash the machine every day and apply products such as a spray-on corrosion inhibitor. Snow tires aren’t a necessity; however, Stephan points out that some operators opt for siped tires to aid in winter work. 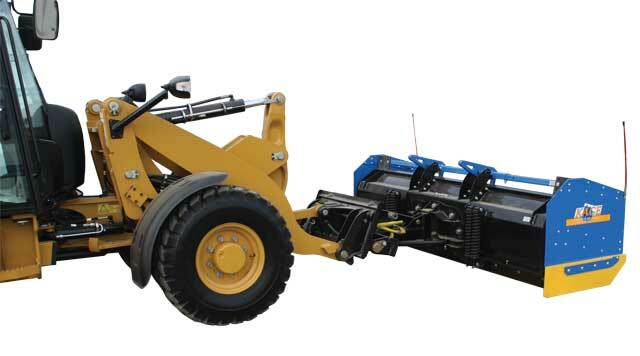 Next up is outfitting the compact wheel loader with the right attachment for snow removal. Since no two projects are alike, there are plenty of tools to choose from including snow plows, pushers, blades, brooms and more. Snow plows and pushers are popular choices in snow removal because operators can move large volumes of snow at a fast rate for big parking lot cleanup. According to Mike Stephan, president and co-founder of Kage Innovation, it’s critical that any snow plow or pusher an operator chooses is equipped with a mechanical float, allowing the plow to move up and down over contours in the pavement. “Typically, compact wheel loaders are equipped with anywhere from 10- to 14-ft snow plows or pushers,” says Stephan. “Rule of thumb, however, is to look at the site that the unit is on, and what kind of flexibility you need the machine to have. If there are areas where you need to be more maneuverable, you may want to downsize the plow slightly in order to have a machine that is versatile, rather than just a brute force monster. Edge, distributed by Manitou Group, offers an oscillating snow push that follows the contour of the pavement a wheel loader is clearing. This is great for maneuvering over obstacles such as manholes. V-blades work great for sidewalk and parking lot cleanup, because you can put them in a couple different positions. Angle brooms are ideal for removing 3 or 4 in. of snow and are generally used around buildings and for sidewalk cleanup. Attachments aren’t just for the front. Moving on to the back of the wheel loader, snow removal companies can turn to salt spreaders for their operations. 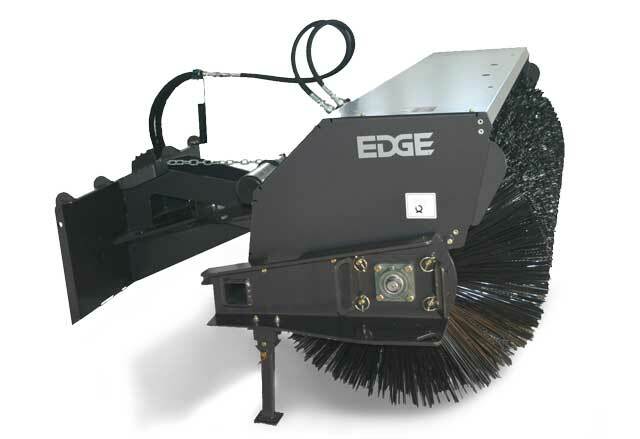 For example, Edge offers an electric spreader. Peters explains that the spreader allows operators to run a snow blower or plow on the front of the machine, clean the area and then flip a switch to start spreading salt on a parking lot. Pam Kleineke is the managing editor of Compact Equipment. Wheel loaders offer operators 360-degree visibility of a jobsite. Sure, your machine may be ready for winter work, but are you? Although the operator’s manual is a good place to start for how to run the machine, wheel loader and attachment experts offer tips to keep you and the public safe. Compact wheel loaders are known for their visibility — which earns them major points for safety — but dreary winter work adds obstacles. Operators need to be aware of what’s going on around them, especially when working in the dark. Check out more info on snow attachments here.